The Merchant Adventurers’ Hall started this discussion with two big questions: who is the sitter and who is the artist? The starting point was the fact that the sitter was wearing the Lord Mayor of York’s chain of office. The other most striking thing about this portrait was the sitter’s youthful complexion. Early on in the discussion the name Henry Thomson was suggested. 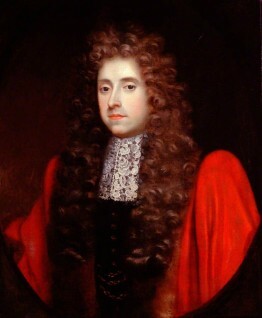 Bruce Trewin noted that in 1663 Sir Henry was 38 years old, which would have been a suitable age for the portrait. Interestingly the collection has a portrait of Sir Henry Thomson that hangs in the Hall. However the collection did not agree and thought that 1663, when Sir Henry Thomson was Lord Mayor was too early for the portrait. This prompted the collection to research the Thomsons and find that Sir Henry Thomson was a Merchant Adventurer but his son was not. However Henry Thomson was an MP for York from 1690­ to 1695. The title of the work was amended to Henry Thomson (d.1700), Lord Mayor of York (1699). In regards to an artist attribution we have been unsuccessful and are unlikely to be able to add anything new on this site from the image and evidence available. Suggestions as to who the artist may have been are: Jacques Parmentier, John Lambert, John Riley, Godfrey Kneller and the circle of Jacob Ferdinand Voet. It was concluded that the artist is most likely to have been a regional painter. Editor’s note: this change will appear on the Your Paintings website by the end of August 2014.
Who is this unknown Lord Mayor of York and who is the artist?